During this fiscal year starting July 2018, Portland Meet Portland has walked with immigrant and refugee individuals and families as well as dominant culture Portlanders to increase the voice and agency of Immigrants and refugees and to foster advocacy and accompaniment with refugees on their own journeys. Numbers do not always speak for themselves, so read on below and hear what our participants had to say about their experience. Portland Meet Portland brings together dominant culture and immigrant/refugee individuals for deeper and sustained learning and growth. These are 2-way relationships where both people are considered mentors to the other. We know that creating cross-cultural community is just as much (or more) about engaging, opening up, and changing dominant culture Portland as it is about engaging immigrants and refugees. Mentorship matches are one way we do this. We have many such 1 -to-1 mentor matches. Here is Lora Gordon telling about her experience as a mentor. In March 2018, PMP partnered with Portland Art Museum to co-create much of the educational and interpretive media programming around the Common Ground exhibition by Fazal Sheikh. We co-hosted the Miller Family Free day, provided docent training, hosted lectures and dialogues, created podcasts, and created the Portland Meet Portland room that featured the work of refugees the Portland Meet Portland works with. Here is Ayan, one of the RISE students that we worked with in our Reflections on Common Ground podcast. She is an amazing young Somali woman who, through her participation, changed us. In what ways were were able to provide her a conduit for her to reflect on her own life and use her own voice, she gave back ten fold in the joy and insight she brought to those around her. Watch her, in this video we co-produced, recite an original poem "Racism" against the backdrop of the Common Ground Exhibition. Every summer, Portland Meet Portland hosts one or more refugee youth as interns. During the summer of 2017, we hosted four refugee youth SummerWorks interns from Multnomah County. The experience was beyond successful for both the interns and all of the people who worked with them. Read more about the program and impact at Multnomah County's MultcoGlobal site. "Last month I had the opportunity to host a group of five young women at the studio who had moved to Portland as refugees from Nepal and Burma. It was equal parts fun and fascination trying to convey the philosophy and mechanics of a movement system they had never heard of before. We spent time on the mat and on the equipment learning how to “turn on” muscles and find alignment. There were a few groans about how hard Pilates is but, more importantly, lots of laughter muddling through Knee Folds, Hundreds, Roll Ups and Teasers. Their laughter and positive energy has stayed with me over the weeks since they visited the studio. It was pure joy introducing Pilates to these newcomers. It reminded me of the importance of facing new experiences and new places with humor and grace. It also reminded me to not take my own Pilates practice too seriously. Pilates is fun, after all! On the cusp of Bloom’s one-year anniversary, their questions about why I opened a Pilates studio helped me reflect on my passion for and belief in this movement system. And my desire to provide a safe and empowering space for people to find a mind-body connection that gives them strength inside and out." In 2013, the Stories of Our Village project emerged as an opportunity to share stories of one of the most diverse communities in Portland = New Columbia. The mission of the story project was to capture in their own words a variety of voices from the New Columbia world. We've provided one of the 'Stories from our Village' publications for you to enjoy. You can read the full Stories from Our Village right here. After moving here, I saw things I was not used to: a lot of kids out late in the park. Just not used to that. I also felt a barrier between the cultures and races. When I heard some kids talking bad about the Mexicans, I didn’t feel too good about that. I wasn’t used to prejudice. I grew up in Iowa and was never exposed to any racism. I am from Togo, West Africa, and was raised in a village given to my ancestors through time. My family lived there 8 years before we moved to a bordering country as refugees escaping political turmoil. 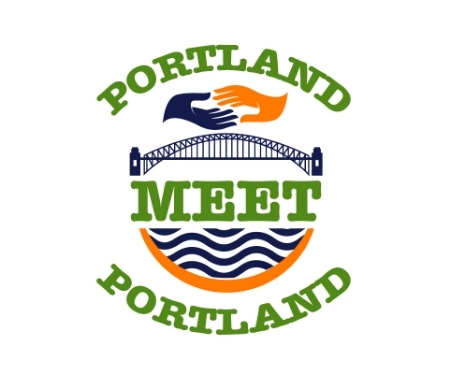 Portland Meet Portland (PMP) believes that building confidence and friendship across cultures and between newcomer refugee youth and mainstream American youth is a vital part of developing healthy, trusting communities. A unique program was made possible for such an opportunity through a Riding Scholarship Fund established at the Arbor School of Arts and Sciences, in partnership with PMP and Big Dog Stables. In November 2016, three refugee girls began taking weekly lessons at Big Dog. One of them, See Yo Htoo, who is now a youth representative Board Member of PMP, wrote the following story to develop her writing and public relations reporting skills. NAh Blue Say Wah (LEFT), See Yo Htoo (Middle) and Shee Gay Way (Right) with Nana at Big Dog Stables. The two sisters, Nah Blue Say Wah and Shee Gay Way were both born in a Thai refugee camp. Their parents arrived at the camp escaping civil war in Burma (Myanmar). The family lived in the camp for seven years and resettled in Portland 2010. Nah and Shee arrived at a young age with their nine family members: both parents, a grandmother, three other sisters and one little brother. Nah is the third child and Shee is the fourth child. They’re two years apart from each other and yet have opposite personalities. Naw, who is into fashion, is shy around unfamiliar people but outgoing with the people she is comfortable with. Shee, on the other hand, is always outgoing, an avid singer, and very mature for her young age. Despite their personality differences, the sisters share many hobbies including playing basketball and piano, cooking, and now, riding horses. Growing up as refugees, Nah, age 13, and Shee, age 11, had never seen horses before - they had only heard of them and seen pictures in a book. For them, the opportunity to ride horses has been a dream come true. Shee said “I wanted to try horse riding because the horse sounded fun to me but then I felt excited to actually see real horses and get to pet them because I only see horses in books.” Nah added “I wanted to try it because I never tried it before. When I was little I was always interested in horse. I wanted to know how it feel to ride a horse. I want to have a little experience.” Neither girl ever expected to join horseback riding with Big Dog Stables , but their dreams and wishes came true when Portland Meet Portland and the Arbor School of Arts and Sciences offered them a scholarship to take riding lessons. Shee Gay Way riding Scooterbug with no hands as Judy Herson guides her. In addition to learning about responsibility in horsemanship, the two sisters are improving their skills in horseback riding, “Now I’m trotting, stirring [sic] and jumping, [and in the] last two weeks I just started learning how to canter,” said Nah. Shee is progressing similarly. “I'm doing cantering, trotting, jumping and learning how to use the tools for horses and clean up the horse after riding it,” said Shee. The two refugee girls have learned a lot through riding, and also that “everyone has something to teach and share” says Judy. And, given Portland Meet Portland’s mission to foster friendships between refugees and mainstream communities, the girls have learned much from their teacher Judy and Ally and from two younger barn interns; Zoey and Eloise. Shee said, “The teachers at the barn are great because they're good at structuring us, when horses is naughty. And, Judy knows how to stop the naughtiness, also the girls there are nice.” It is a rare opportunity for refugee newcomers to intersect with mainstream American girls in a shared hobby and around a growth challenge like riding horses. Both Nah and Shee said they would give the barn and their experience a 10 out of 10. They agree that “It’s fun… and when you have stress you should go and ride horse because it’s between you and the horse and no one else and your stress will disappear, that how I released my stress.” While Shee said “ I think I would tell the people who are scared to actually see the horse and start riding it and they will feel confident.